Preached at St. Silas Lutheran Church on 1 Kings 21:1-29. 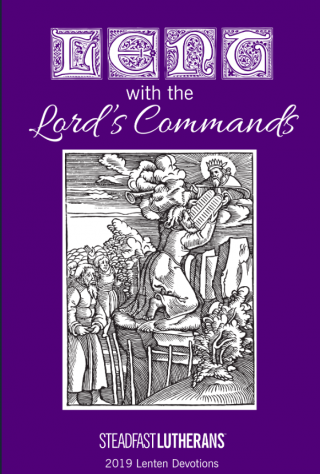 Every one of the Ten Commandments protects a gift that God has given, as we’ve been hearing through the season of Lent. The Eighth Commandment protects God’s gift of a good name and reputation, which is a very precious thing, as it says in Proverbs 22, “A good name is to be chosen rather than great riches, and favor is better than silver or gold.” So God doesn’t allow people to testify falsely about each other, slander one another, or gossip about anyone else. Now if someone casts aside his own good name by public sin, that’s his business, and he can bear the consequences. But we aren’t allowed to take a good name away from anyone, whether by spreading gossip or by telling lies. The Ninth and Tenth Commandments both protect God’s gift of the right to keep what he has given us. In order to understand these commandments, we must understood what is meant by the word “covet.” The Hebrew word that gets translated as “covet” simply means “desire,” and can refer to good or bad desire. Even in paradise there were desirable things, as it says in Genesis 2, “And out of the ground the Lord God made to spring up every tree that is desirable to the sight and good for food.” The same word is used here as in the Ninth and Tenth Commandments. So desire can be good, and the Ninth and Tenth Commandments don’t prohibit desire entirely. They simply prohibit us from desiring the wrong things. The first instance of desiring the wrong thing happened at the Fall. “So when the woman saw that the tree was good for food, and that it was a delight to the eyes, and that the tree was desirable to make one wise…” and you know the rest. What made this a bad desire? It was a desire for something that God had not given, and that distinguishes between good and bad desire. It’s good to desire the things that God has given you, that is, to delight in them and find them pleasant. It’s a sin to desire things that God has not given you, and it’s this bad desire that we call coveting. The account of Naboth’s vineyard began with Ahab coveting. Ahab saw that plot of ground next to his palace and thought, “Oh, it would be such a nice place for an herb garden! I could grow mint and cumin and dill, and look out my window, and see the pleasant little plants growing, and smell the spices blending together in the air and wafting up to my bedroom.” Now Ahab had a palace. He was the king of Israel. What’s one vineyard compared to all the land he already owned and all the wealth he had already accumulated? Yet our sinful nature always desires more and is never content, and when once it fixates on something it is difficult to turn away from it. And so Ahab pines away in his bedroom, moping and refusing to eat, as if Naboth’s vineyard were the only thing in the world that could satisfy him. Jezebel came to Ahab and couldn’t fathom why Ahab didn’t just take the vineyard: “Do you now govern Israel?” In other words, might makes right. If it’s in your power, then do it. The people of the world hold to this adage, at least while they have the upper hand. Yet the Lord says in Micah 2, “Woe to those who devise wickedness and work evil on their beds! When the morning dawns, they perform it, because it is in the power of their hand. They covet fields and seize them, and houses, and take them away; they oppress a man and his house, a man and his inheritance. Therefore thus says the Lord: behold, against this family I am devising disaster, from which you cannot remove your necks.” Just because you can acquire something does not mean it’s yours to acquire. Yet, as Luther writes in the Large Catechism about the Eighth Commandment, “It is a common, pernicious plague that everyone would rather hear evil than good about their neighbors. Even though we ourselves are evil, we cannot tolerate it when anyone speaks evil of us; instead, we want to hear the whole world say golden things of us. Yet we cannot bear it when someone says the best things about others” (I.264). And knowing this about human nature, it’s no surprise that the people are perfectly willing to listen to evil things about Naboth and stone him to death. So Naboth was out of the way. But why should the vineyard fall to Ahab as opposed to someone else? Because not only did Naboth supposedly curse God; he also cursed the king. It would only be right and just that the king should get the goods of the man who dared to curse him. That would set a fine precedent so that others would not engage in such disrespect, and it would be a fine restitution for Ahab, whose precious reputation had been so slandered by that rogue and scoundrel Naboth. And so you see that in the eyes of Israel, Ahab was perfectly within his right to take possession of Naboth’s vineyard. Yet this was far from being “right.” We recognize it in Ahab’s case. But we will only be wise if we recognize it in our own. Consider these lines from the Large Catechism, “Such is nature that no one wants someone else to have as much as he does. Everyone tries to accumulate as much as he can, and lets others look out for themselves. Yet we all consider ourselves upright people, and put up a fine front to conceal our villainy. We hunt for and think up clever tricks and shrewd tactics―better and better ones are being devised daily―under the guise of justice. We brazenly dare to boast of it and defiantly insist that it should not be called rascality but shrewdness and foresight” (I.297-298). But understand that no matter how “right” it may seem in the eyes of man, if you desire that which God has not given you, it is never right. We see this in Ahab’s case, who, though he appeared to get away with it, was nevertheless convicted by God. The judgment was not a light one: the same thing that happened to Naboth would happen to Ahab. Now there’s comfort in this for us in that no one can get away with anything evil against us, no matter how right it looks in the eyes of man. God can see the heart, and he knows which desires are right and which are covetous, and he avenges very severely the wrongs that receive no justice from man. Yet this is also a terror for us, and for the same reasons. God can see the heart, and he knows which desires are right and which are covetous, and though man may reckon you to be innocent, God will not be fooled. How shall we escape the wrath of God? Consider the end of the reading. If the Lord showed some amount of compassion to Ahab, who was not sincerely repentant and had no faith, then the Lord will certainly have compassion on those whom his law has made contrite and who do have faith in Christ. You have a greater Naboth, who was slandered and falsely condemned for your salvation, who refused to give up his inheritance and was willing to die for it. His blood does not call out for your blood, but he is risen and his blood calls out for your pardon. In Jesus Christ alone is forgiveness of sins and the fulfillment of the Law, and to his saving work we turn our attention in the coming Holy Week. To him be glory forever. Amen. Thank you for your article. On an interesting note, I once had a pastor state that the Eighth Commandment didn’t apply to pastors and that it was okay for him to listen to rumors, etc., from people within the church. I haven’t found that in the Large Catechism.